We are so very careful with the kind of magic kits we offer on this site. But this package of money magic will make ANY kid extremely happy, and it's the kind of quality magic set you can be proud to give away at a show or to a loved one. 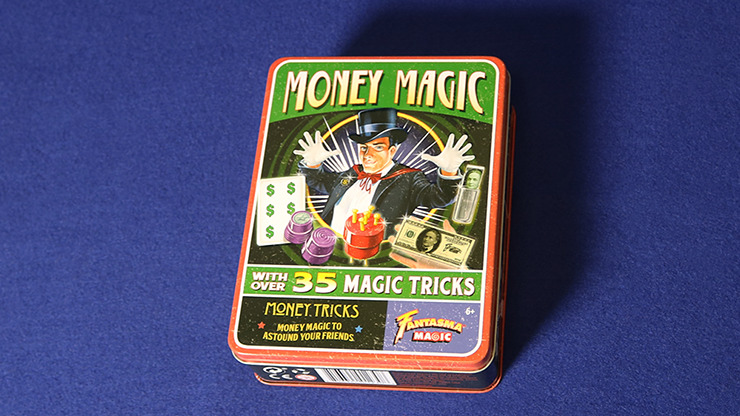 The Fantasma Magic Money Magic Set contains everything you need to do magic with money, all in a great retro-style metal tin! Make an ordinary dollar bill float in the air above your hand! Make coins appear, disappear and change into other coins with the Coin Stand! Vanish a dollar bill with the Time Capsule! Push solid spikes through a solid coin! Multiply your dollar signs with the Four-Sided Card! And much, much more! More than 35 tricks with money will baffle your family and friends! As with all of Fantasma's products, The Money Magic Set is endorsed by the International Brotherhood of Magicians -- the only magic products on the market today to carry this seal!